Habitat: Widely distributed in coastal marine waters and is part natural flora of bivalve shellfish (clams, mussels, and oysters). The bacteria are most prevalent during warm summer months. Disease or illness: Infections start with diarrhea (sometimes bloody), stomach cramps, vomiting, headache, fever and chills. Symptoms usually start 12-24 hours after eating raw or undercooked shellfish. Who is at risk: Anyone who eats raw or undercooked shellfish from contaminated waters. Avoidance techniques: Properly cook shellfish products to destroy the bacteria. 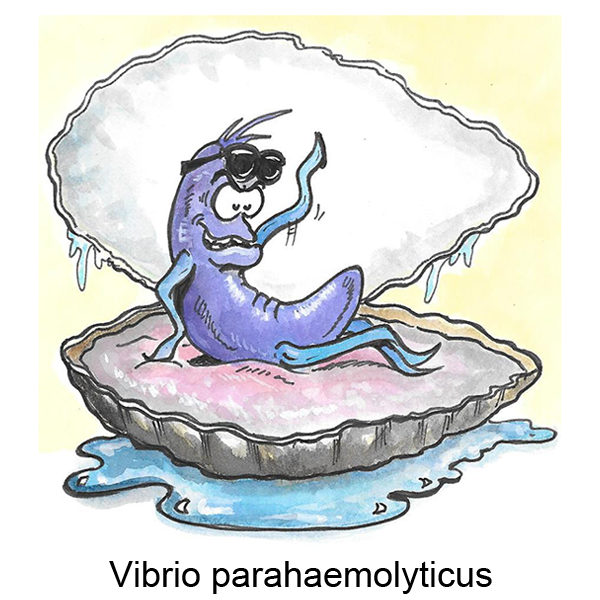 Chill raw shellfish as soon as possible after harvest and keep at cool temperatures because Vibrio can multiply 50-fold in just 10 hours.